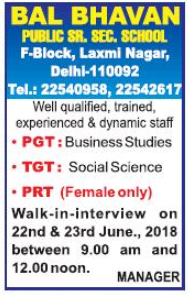 Bal Bhavan Public Senior Secondary School, Delhi has advertised in The Hindustan Times newspaper for the recruitment of PGT plus TGT plus PRT job vacancies. Interested and eligible job aspirants are requested to walk-in on 22nd and 23rd June 2018. Learn further more details below. About School: Bal Bhavan Public School, Mayur Vihar-II, an educational setup, set in 1967, is a vision come true, for an individual, who dreamt of a realm of education institutions offering and spreading education to the upcoming generation.